You have presented with a painful joint and imaging is compatible with an arthritic process and/or a bone marrow lesion (contusion/bruise). Bone supports the joint and when damaged either by injury or as part of the arthritic process, contributes to pain and the progression of arthritis. The bone marrow lesion is seen on the MRI while the change of bone, subchondral sclerosis, is seen on the routine X-ray. Patients with Bone Marrow Lesions are known to have increased pain, less function, faster joint cartilage destruction and reduced benefits from present forms of intervention. By addressing not only the arthritis but the bone surrounding the joint, it is anticipated that the results of intervention for the arthritic or injured joint will be markedly improved. Subchondroplasty is a minimally invasive procedure targeting and treating subchondral defects that is the altered bone adjacent to and responsible for supporting the joint. During the treatment phase of injecting Bone Marrow Aspirate Concentrate for the arthritic joint, the subchondroplasty adjunct is completed under the fluoroscope. In conjunction with delivering the BMAC into the joint itself, additional Bone Marrow Aspirate Concentrate is placed into the surrounding bone through small drill holes created with a special canula. Up until now, the subchondroplasty drill holes were filled with a synthetic substance manufactured from Calcium Phosphate. The theory was that the Calcium Phosphate granules when placed into the bone defect would eventually be resorbed and replaced by bone. Using Bone Marrow Aspirate Concentrate is a much more physiologic stimulus for effecting bone healing in a much shorter time and by a means that more closely approximates bone healing after injury. 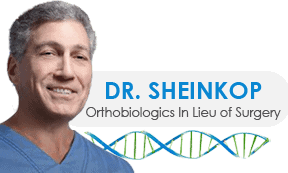 Our goal is to assist the patient in delaying or possibly avoiding a joint replacement through Regenerative Medicine (Cellular Orthopedic) approaches. The Bone Marrow Aspirate Concentrate intervention has proven extremely successful in meeting those goals. The introduction of Subchondroplasty will allow us to offer the possibility of increasing the success rate and the longevity of effect in appropriate settings and in any joint; hip, knee, ankle or shoulder.